Exploring the Chesapeake-Mapping the Bay Exhibition will display the changes in maps over time as an expression of what people were seeking in the Chesapeake—for natural resources, for safe passage, or for commercial opportunities. The exploration begins with European exploration in the 16th century, and continues with the growth of settlement in the region in the 17th and 18th centuries. 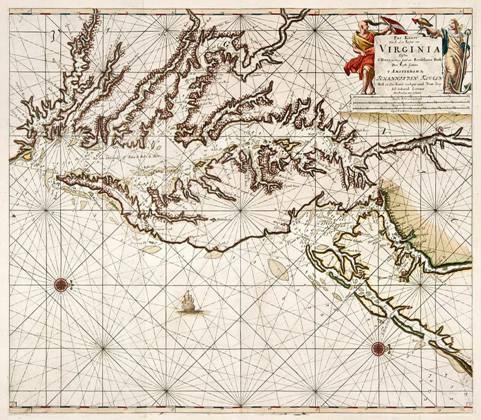 Exploring the Chesapeake looks also at maps that have been created as part of a sales pitch for the region and its bounty, beginning with some of the earliest maps of the Chesapeake colonies, which sought to lure settlers to the region. Significant to the story are charts developed to help mariner’s make a safe passage through these waters, as improved surveying methods produced increasingly accurate charts through the 19th and 20th centuries. When the oyster fishery boomed, charts were adapted to include information about where these valuable bivalves abundantly grew along the Bay’s bottom. Maps also help track how much and how fast the Chesapeake is changing, through natural changes like eroding shorelines, and man-made changes including dredged channels and artificial islands. The exhibition is generously sponsored by Ellen and Norm Plummer and the Maryland State Arts Council, and continues in CBMM’s Steamboat Building.